While my dear friend didn’t quite go fetal like Miss Bell, the chance to hold a lamb did bring tears to her eyes and she was overcome with complete and utter joy. I wish I had been there to capture the moment with my own eyes. It’s refreshing to see such a reaction from an adult – one that is usually only seen from a young child not yet afraid of expressing their emotions to the fullest. 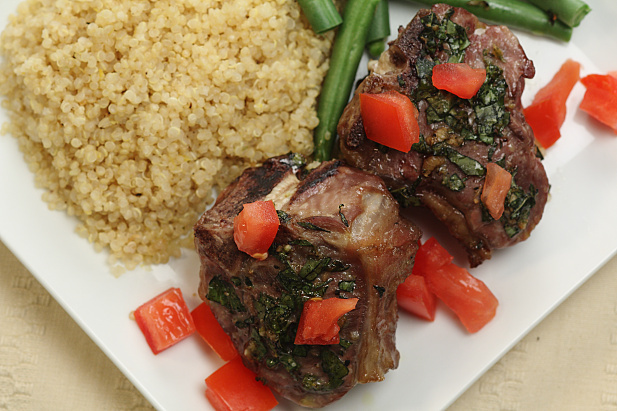 Nikki not only wants to cuddle cute little lambs, but lamb happens to be one of her favorite meals. Now I realize I may have just made her sound creepy [and she’s totally not] but if you also love to eat lamb I’m positive you aren’t going to tell me you don’t think they are as adorable as they are tasty. And boy is lamb tasty! With so many different food movements and the drive to try new and different cuisines, I’ve found that lamb has become more readily available nowadays and I’m all for celebrating that. I happened upon an amazing sale on lamb at Bristol Farms last week and stocked up on a few different cuts of meat. Usually I think of lamb in Indian or Moroccan food but there’s no reason it can’t be as versatile as any other popular carnivorous choice. 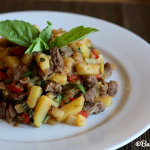 The meat is extremely flavorful on its own and blends well with many different herbs and spices. 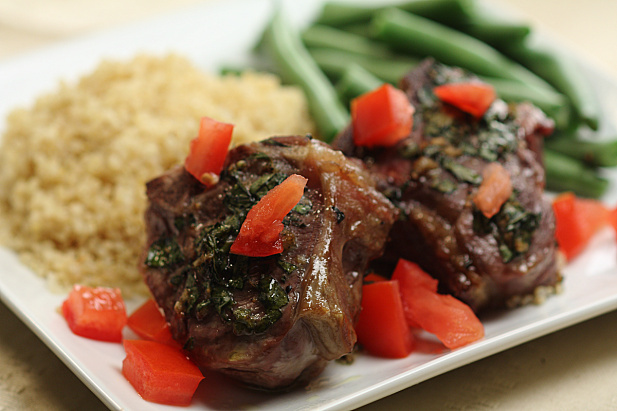 These lamb loin chops were simply coated with a basil rub and roasted in the oven. They came out juicy, tender and bone-sucking delicious. 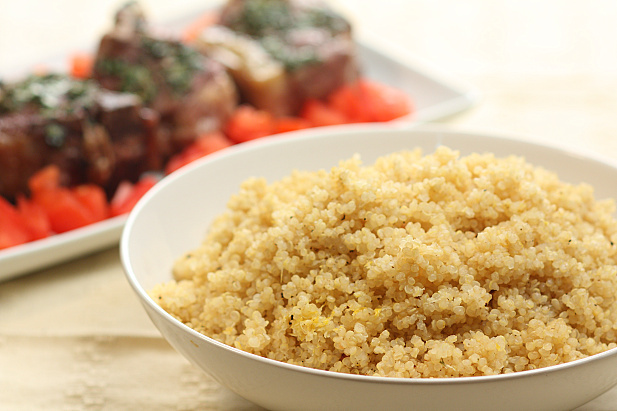 The lemony quinoa with its bright cheery disposition was the perfect accompaniment and was particularly good soaked in the juices from the lamb. When the meal is done, don’t throw away those bones! Boil them in water with onion, carrot, celery, wine and a few herbs for a nice stock. Then save it for a night when you finally decide to make that risotto that you’ve been promising yourself to try one day. Nikki’s birthday was last week and now I’m thinking I should have taken her to a sheep farm to celebrate but that might’ve proven to be a little complicated here in San Diego. Ah well, I’ll just cook up some delightful lamb chops instead. 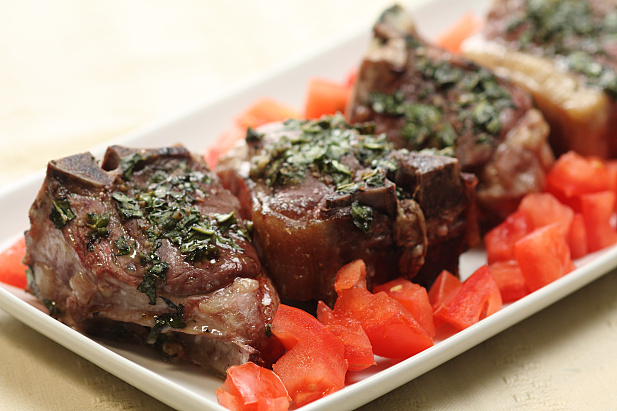 For the lamb chops, stir together the basil, salt, pepper and avocado oil in a small bowl. 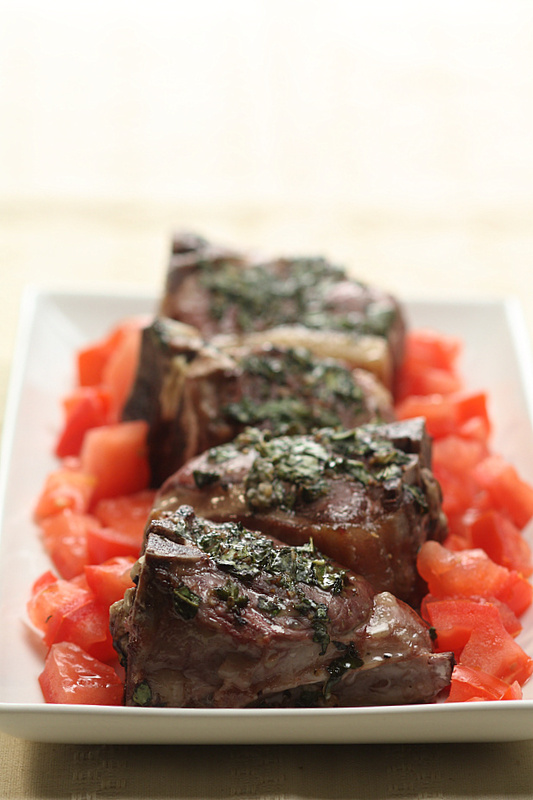 Rub the mixture on both sides of each of the lamb chops and place in a shallow baking dish. 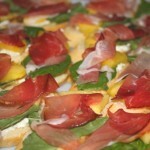 Cover and refrigerate at least 1 hour (up to 1 day). Preheat the oven to 375 degrees. Roast the lamb chops, uncovered 35-40 minutes or until an internal thermometer registers at least 150 degrees for medium. Meanwhile make the quinoa. In a medium pot over high heat, heat the chicken broth to a boil. Add the quinoa, cover and reduce heat to low. 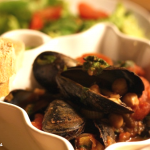 Simmer for 12-15 minutes or until liquid is absorbed. Add the lemon zest and lemon juice and fluff with a fork. 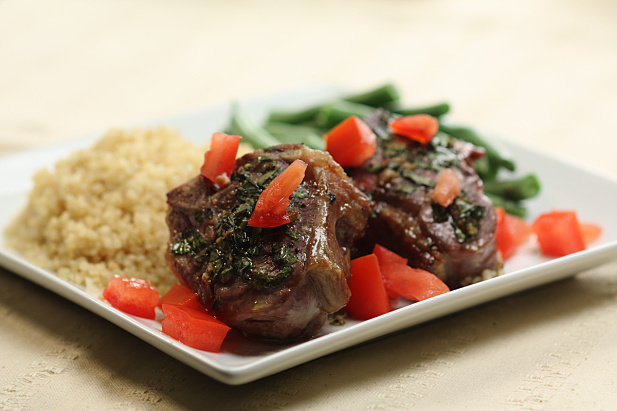 Serve the quinoa and lamb chops together topped with the chopped tomato. 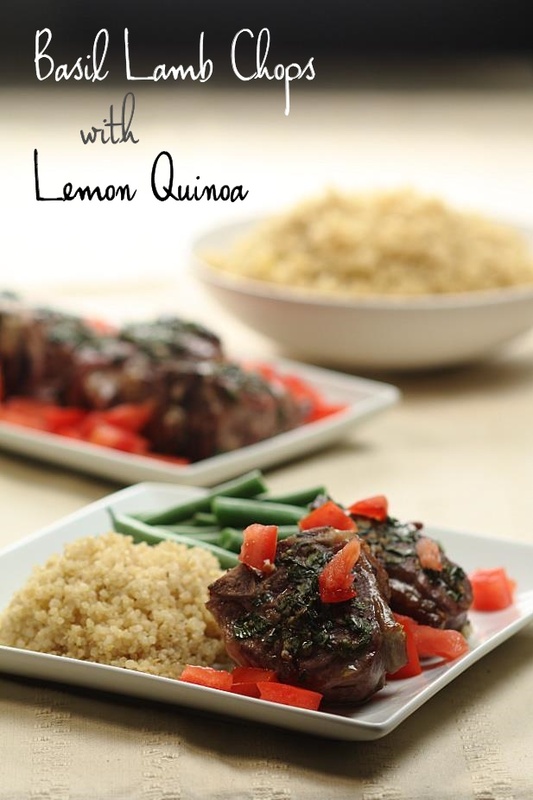 You had me at “lemon quinoa!” This is a perfect option for my meat-eating boyfriend and my non-meat-eating self to enjoy together!